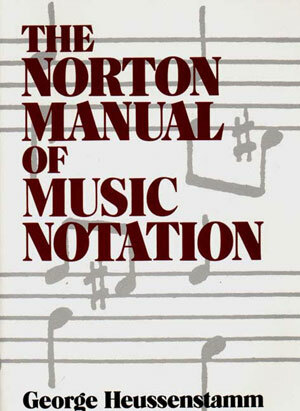 The Norton Manual of Music Notation is designed to serve as a practical guide to music handwriting and music-writing procedures. It provides the music student with an essential tool for learning to put notes down on paper with clarity and speed. At the same time, it serves as an indispensable reference to a wide variety of notational conventions. Part I deals with ELEMENTS OF NOTATION, arranged in the order they are found in printed music, i.e., clefs, followed by key signatures, time signatures, etc. For each element, a model, a model is given and, where appropriate, simple drills provided. In part II, the ELEMENTS ARE COMBINED and the student is introduced to considerations of spacing, changes of meter, clef, and key as well as the notation of syncopation and irregular divisions of the beat. Part III delineates SCORING PRACTICES ranging from notating two lines of music on one staff to discussions of transposing instruments, orchestral score layouts, and the extraction of instrumental parts. 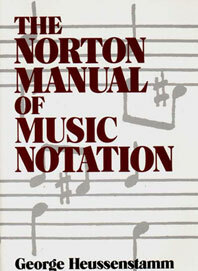 The author provides an appendix designed for those who wish to achieve more professional results; copying tools, materials, and techniques, as well as popular-music notation are described in detail. George Heussenstamm is a frequently-performed composer who has prepared his own scores for years. The copying skills he developed enabled him to give very successful courses in music notation at several California universities. The present book is the practical result of his experience as a teacher and professional copyist.